I'm certainly no expert when it comes to fashion. But there are a few trends that I've really been loving lately. I'm definitely more of a dress person than a jeans person - but if I could pull these off, then I most certainly would! What do you think? Would you wear these, too? I'm all over the bright colored jeans. Just did a post about it today, actually! I say go for it, why not?! i LOVE those leopard skinnies! All three of those are SO cute! i don't think i'm bold enough to wear patterned pants... but i do have some bright orange ones! i need a pair of these!! 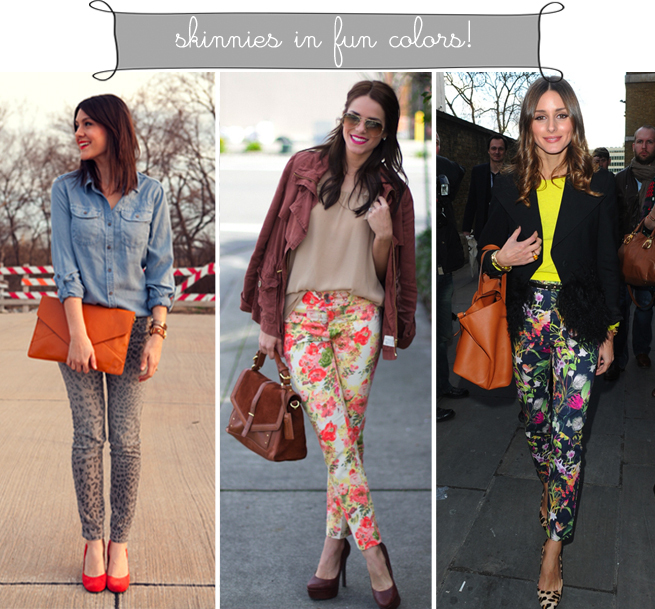 yes yes yes i would totally wear skinnies with loud prints!! i have tons of solid ones, but looks like i need to invest in some with prints before spring hits. great inspirational pics. So cute and inspiring. I especially love the jeans. Cute blog! !